With the same emotional generosity and effortlessly compelling storytelling that made All Over But the Shoutin’ a national bestseller, Rick Bragg continues his personal history of the Deep South. This time he’s writing about his grandfather Charlie Bundrum, a man who died before Bragg was born but left an indelible imprint on the people who loved him. 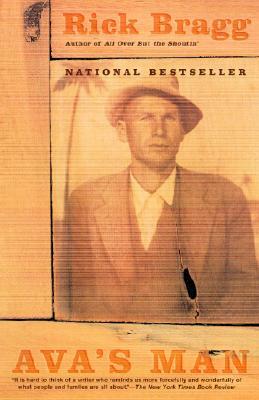 Drawing on their memories, Bragg reconstructs the life of an unlettered roofer who kept food on his family’s table through the worst of the Great Depression; a moonshiner who drank exactly one pint for every gallon he sold; an unregenerate brawler, who could sit for hours with a baby in the crook of his arm. In telling Charlie’s story, Bragg conjures up the backwoods hamlets of Georgia and Alabama in the years when the roads were still dirt and real men never cussed in front of ladies. A masterly family chronicle and a human portrait so vivid you can smell the cornbread and whiskey, Ava’s Man is unforgettable. Rick Bragg is the best-selling author of All Over but the Shoutin’ and Somebody Told Me. A national correspondent for the The New York Times, he was awarded the Pulitzer Prize for feature writing in 1996. He lives in New Orleans.